SPF clothing an alternate sunscreen? Sunscreen or Sun Protective Clothing? SPF clothing with its enhanced UV protective qualities provides an option for taking sun care above and beyond sunscreens or sun blocks. Any clothing will provide for some protection from the sun. An ordinary T-shirt will provide about the equivalent of a Sun Protection Factor (SPF) 8 and most clothes will not exceed SPF 30. Is SPF clothing really an alternative to using sunscreen? Once the material has been certified as UPF 30 or UPF 50+ or such, it will remain UPF 30 or UPF 50+ for as long as you wear the garment. Even if you are wearing sun protective clothing, sunscreen is always required for areas of your body that may still be exposed to the sun's UV rays. Your face may require extra protection even though wearing a hat, as the sun's rays are easily deflected or reflected off different surfaces such as water, snow, glass, or even the earth below our feet! Areas often forgotten or needing extra cover are your nose, chin, neck, feet and hands. Then there are examples of extremity where double protection is a good thing ie. wearing sunscreen and SF clothing. SPF Clothing - What to look for? Has it been tested officially for SPF/UPF and is not made of inferior material? Is it chlorine resistant or salt water resistant if required for swimming? Can it protect you from over 97.5% of both the UVA and UVB rays? 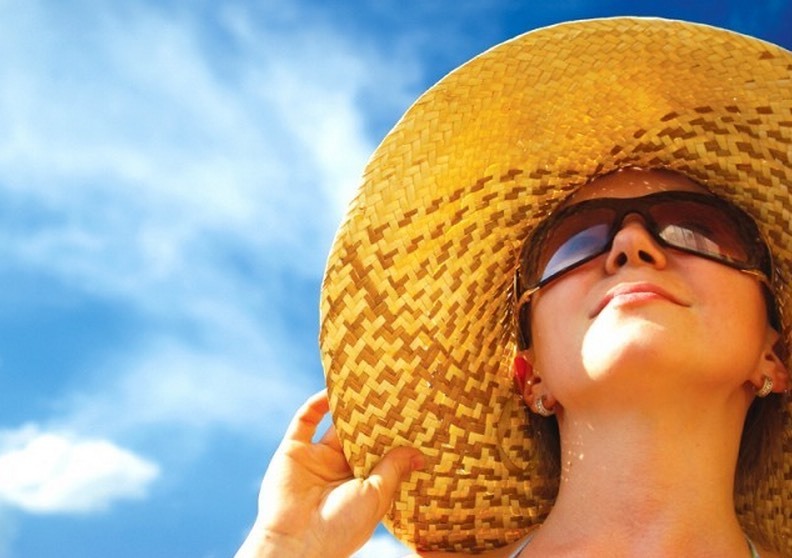 Will SPF Clothing make me really hot? Although the intention is to cover a lot of your body, the material used is made of a tightly woven, lightweight and cool material that reflects heat and helps to keep you feeling cool. The origins come from a need in desert wear, long-distance horse, camel or bike riding as well as extreme athletes. Nowadays it is engineered to withstand the abuse of sport and outdoor activities, enabling your body to move freely and stay cool, even in peak summer heat. Many protective clothing products include mesh panels and openings to allow cool air to enter and warm air to exit. Taking care of the fabric is essential for long wearing but instructions are usually quite explicit and easy. Mostly they can be washed in cool water with mild detergent, rinsed, line dried and ready to wear in the morning. Sometimes they require hand washing. 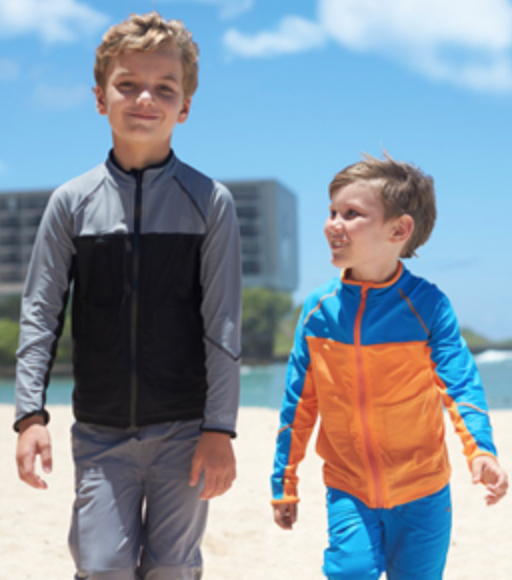 The sun protective swimwear is especially prepared to enable wearing in salt water and/or chlorinated water. Some hats are chlorine and salt water resistant as well, so they can be worn in the water. Some can be quite sophisticated so can be worn at the sailing club, on the boat, at the poolside, or outdoors anywhere! They usually have soft, elastic cuffs with an underarm mesh. leggings, with a range of colors that coordinate with shirts and jackets. some even have air panels at the calves and lower thighs for ventilation. All water wear is made from lightweight, stretch fabric that allows you to move freely as well as dry quickly. Swim shirts are usually zip fronted and long sleeved, with some even female figure flattering. Trousers or leggings are close fitting. Always rinse garments in fresh water as soon as possible after use to enable the longest wear.